Very often people working on the Internet, whatever profession they may be in, struggle with website/graphic designs. A bad design can negatively impact any company/brand and this is where online tool “RelayThat” has an important role to play. The tool works with your brand to find the best design suited for any occasion. By using the RelayThat tool, non-designers who find design concepts difficult to handle, are able to come up with unique and one-of-a-kind designs. The tool has also proven to be helpful for professional designers to finish up common tasks. In both cases, RelayThat is known to save a lot of time. RelayThat works in a simple manner. All the client needs to do is upload their logo, necessary text, brand colors and some images. After the input is given, RelayThat will show you a million options to choose from. The RelayThat tool works as a design explorer giving brands many options to choose from. It helps companies come up with designs they would not have even thought of, and that too without spending much time and effort. Founded by designer Craig Carpenter, RelayThat was born out of the need to overcome the boring job of building and formatting images for different social media channels and blogs. The tool works well with all industries like health & fitness, small and medium businesses, events, retails and franchises. It edits and works on many images in very little time. It offers clients a default project and a sample project as examples. All the images used in RelayThat are 100% copyright free so brands do not have to worry about spending more on a design. The client will first need to set up their colors, fonts and logos. Then the photo collection will be uploaded and the tool will do the rest of the work. You can create all types of images and fonts with the RelayThat tool. The tool is available in three packages: 1) Personal at $ 25 per month, Pro at $45 per month and Business at $97 per month. When you open the tool, you come to the home page. There you will have to create a project. Click on the New Project option and give it a name. On the right-hand side, you have options for entering the Title name, Subtitle name and Website. You can also enter the brand logo on the design. Before selecting any graphic, you need to select the size of the graphic like square post, blog post, Facebook cover etc. It will show different designs and formats for your graphics. You can edit the images to your liking by clicking on the icon “Images”. Then one moves to the Style section, where you have different options like “infographics”, “This or That”, “Quote Marks” to style up your graphics. There also numerous images and fonts one can choose from. After the final graphic is selected, click on the button “Download and Save” to save the image in JPG or PNG format. Depending on which package you choose, there are many benefits for each one. They may vary from package to package. 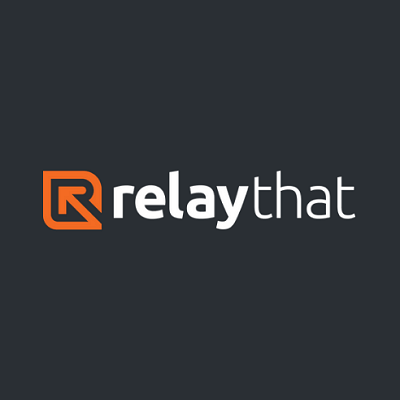 Anyone Can Use It: The biggest advantage of RelayThat tool is that anyone can use it. You need not be a technical person to operate the tool. This works well for non-technical users. Easy to Use: RelayThat tool can make professional branded images for blogs, brands and other social media platforms in a very easy and uncomplicated manner. User Friendly: The tool is very user friendly, as in, all the instructions on how to use it are very simple and straightforward for a person to understand. Not Flexible: The biggest disadvantage of the RelayThat tool is that it is rigid and not that flexible to outside options. Users will have to make do with the given templates and cannot use their own inputs. Cannot Make Many changes: Another negative of this tool is that one cannot make many changes to the graphics selected. The flexibility factor is limited. What really works in favor of RelayThat tool is that it can be used by all. Technical or non-technical, it doesn’t matter. It turns into a designer for you and gives you a million options to choose from, thus saving a lot of time and money. 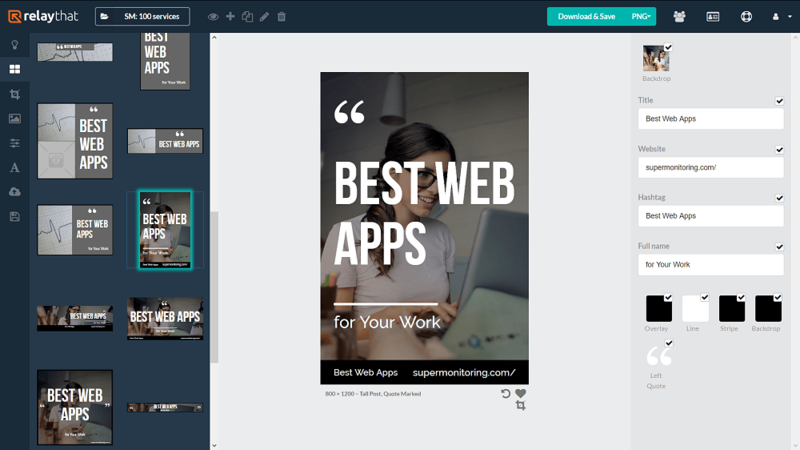 With just a few clicks, you can create as many branded graphics as you want. Posted September 17th, 2018 in Web Design. Tagged: banners, images, social media, stock, templates.